At the age of 19, Bushra Amiwala decided to run against an incumbent man who had been in office for 16 years. She wanted to serve as a voice for her underrepresented generation and for those in marginalized communities. Her campaign mobilized young people all across the country to engage with the political system in ways they hadn't before. 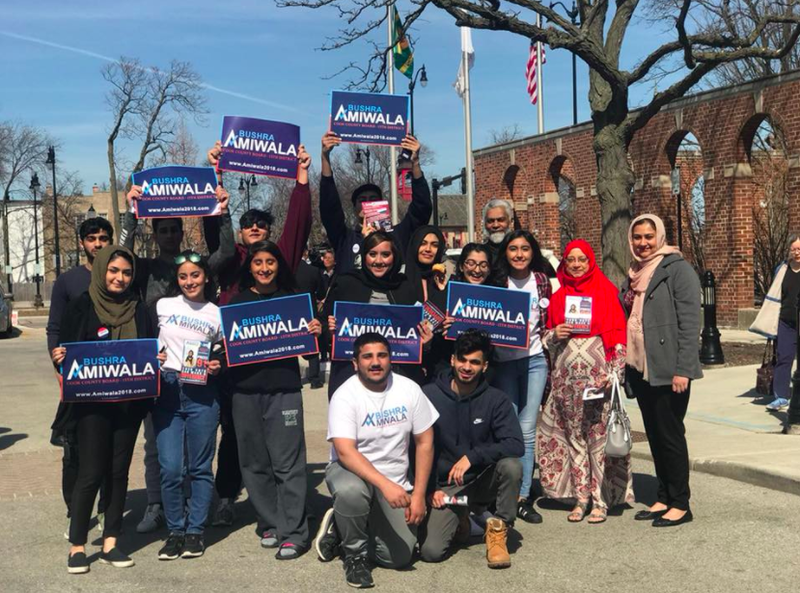 She strives to become the first female Pakistani Muslim elected official in the state of Illinois, and to reverse the negative stigmas attached to people who share her faith. She’s definitely got our vote! Was there a defining moment that lead you to decide to start wearing the hijab? How did things change when you did? I decided to wear the hijab the summer before my freshman year of high school. There actually was a defining moment that resulted in this. I was at an Office Max buying school supplies and in front of me in line was an older, white man, and in front of him was a Muslim woman wearing a burka, the Islamic veil from head to toe. The man then asked the woman, “Aren’t you hot in that?” The tone of his voice and the way he asked didn’t show that he was just curious as to whether she was warm or not. It was clearly a mask of the question, “Why the hell are you wearing that?” I was always aware of the negative stereotypes people held towards Muslim women, but it wasn’t until that moment that I witnessed it. My initial reaction was anger toward the woman who I felt reaffirmed the stereotype by not standing up for herself, but later I realized I had blamed the victim in the situation. Had I been wearing the hijab, the man would’ve turned around and asked me the same question. When I began wearing the hijab, I only used to wear it to school. I felt as though that was an easier way for me to transition into wearing the hijab, which was the most public display of my religion, and in a post 9/11 era, kind of made me uncomfortable. Since I wore the hijab sometimes and didn’t at other times, I was directly able to compare the differences between the way I was treated. For example, a lady on the bus put her purse on the seat next to her to prevent me from sitting there and staff at certain stores would not approach me when I walked in. What advice do you have for Muslim women who may be unsure whether or not they want to wear the hijab? Hijab means modesty in the religion of Islam, and intentions are valued very heavily as well. It should be one’s free choice to wear the hijab. Personally, it was frightening to transition into wearing the hijab, but the more I wore it, the more comfortable I got with it on. It is okay to feel different once you put it on, and it is easy to associate that feeling with fear or discomfort. Whether one chooses to wear the hijab or not, just remember, we define what the hijab represents. The word does not define us. What advice do you have for college women who seek to change society’s views on religion and gender? Young women have been at the forefront of some of the most powerful movements in history. There will be an abundance of people who undermine you for your age, gender and your physical appearance, which can be emotionally taxing and draining. But there will always be more people who are also working toward the same goal as you and are in line with what you believe, even if it may seem as though the negativity is louder than the positivity. The most effective way to enact change is to focus on one problem. It may be tempting to tackle all the race, gender, and religious issues, but know that you’ll have a greater impact if you focus on one. What has the most difficult part of your campaign been? The most rewarding? I lost my election in March, but I still made history: I registered more than 2,000 people to vote, and 30 percent of my votes came from people who voted for the first time. I realized that when people are informed, they want to use their voice. One thing I learned from my experience as a first-time office-seeker that that people were obsessed with my Muslim identity as a political candidate. Growing up post 9/11 as a Muslim woman who wears the hijab, I’m hyper-aware of my identity. While I was running, the first thing most people wanted to talk about was how I wore the hijab. Most of the time the questions were fueled by innocent curiosity, but it distracted from the message of my campaign. People were excited to see a Muslim woman running for office and focused on that—more than they did my policy ideas. Almost every article written about my campaign mentioned that I was Muslim. In one article that debriefed a debate between my two male opponents, it noted: “Amiwala wore a stylish, light pink hijab.” No one mentioned what the two men were wearing. Everyone doubted me, even people from my own community. Within a week of filing my paperwork to run, I got a call from a man active in area politics to come meet at his office. I was so excited and was looking forward to what he’d say when we met. “Don’t run for this position. You should drop out,” he told me in our meeting. I was stunned. It was the last thing I expected to hear. I was broken in the moment, but his doubt ended up serving as the fuel that ignited the fire in my campaign. But I faced more hurdles: when I reached out to the local mosque, most of the men there had no idea what to do with me running for office, and didn’t know how to support me. Many of them didn’t take what I was saying seriously. I also learned that other women and first-time voters are essential to grassroots campaigns. From the beginning of my campaign, I sought the support of the marginalized. I mobilized hundreds of first-time voters—young people, people of color, and people from immigrant communities. “Why bother engaging groups of people who do not matter?” political experts said to me. “Those people will not vote for you, and they won’t vote against you—they won’t donate a single dollar to your campaign.” But they did show up. Over 400 of “those people” came out to my second fundraising dinner where I was able to out-fundraise the incumbent by three times the amount. I personally registered thousands of “those people” to vote for the first time. I spoke to every high school in my district and often times left with hundreds of email addresses from young people eager to register. I led a voter registration drive at our mosque and hosted an event specifically for people in the South Asian community. At that event we looked up attendees’ polling locations and made sure every single one of them was registered to cast their ballot. Running against a man who was already part of the establishment was one of the most difficult political challenges that I could have taken on. But as a first-time candidate, I learned that other women were my most important allies. Early on, I reached out to one woman at the mosque who I didn’t know very well. I texted her that I was running for office, and she called me about 10 minutes later. She mentioned how she normally stays away from politics, but that she had an abundance of materials and resources to share with me. She helped me with every aspect of my campaign, from assisting me financially to introducing me to people in her network who later became invaluable. I am so appreciative of that sisterhood that I tapped into. As we enter a crazy midterms season with many women running, my story is proof that women can and do lift other women up. How can others follow along with or get involved in your campaign? My primary election was in March, but I do have aspirations to run for office again. All of my social media platforms are very active and kept up to date with the events I attend and places I speak at. I am currently focusing on speaking, and have speaking engagements all around the country. I am honored to have inspired others to run for office, and only know this because of the countless messages I still receive.